The Trotsky Museum (Museo Casa de León Trotsky) in Coyoacán, an exhaustive essay, presented both in Spanish with title El Museo Casa León Trotsky: pasado y presente, and in English with title Trotsky Museum: past and present, authored by Prof. Gabriel García Higueras. It is based on first-hand research in Coyoacán, done in 1990 and 2006. This essay, written in 2006/07, features many aspects of the history of the Trotsky house in Coyoacán and of the everyday life of those who lived there in 1939/40. At the same time it features today's Trotsky Museum which Trotsky's house several years ago has become a part of. Trotsky in Coyoacán - a bibliography, an exhaustive bibliographical compilation of published items about Trotsky's final years of exile in Mexico, about his assassination, and about the house in Coyoacán which he acquired in 1939 and in which he was murdered in August 1940 by Stalinist agent Ramón Mercader. The centre of today's Leon Trotsky Museum is formed by the house that Trotsky and his entourage lived in, the garden area with tropical flowers and rare cacti, the outer walls and guard towers, giving the property a fortress-like appearance. 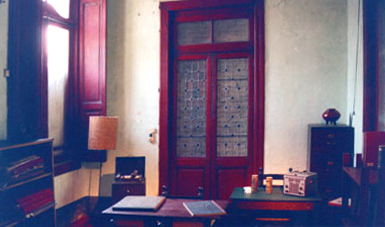 The study in which Trotsky was deadly wounded by Stalinist agent Ramón Mercader on August 20, 1940 remained unaltered (glasses, papers, books, calendar etc.) since then and the same applies to most of the interior of the house. In the early 1980s the complex was declared a historic monument. Some additional small buildings, e.g. the guard houses along the wall, were turned into exhibition rooms presenting photographs, memorabilia etc. with regard to Trotsky, his family and his friends. In the centre of the garden is situated the grave containing the ashes of Trotsky and Natal'ia Sedova; the place is marked by a white stone stele with hammer and sickle and above it a flagpole with a red flag. The current museum was created in 1990, 50 years after Trotsky's assassination, along with the Instituto del Derecho de Asilio y las Libertades Públicas. Today, an auditorium and temporary exhibition halls belong to the museum, too, which is enjoying an annual average of some 17,000 people from Maexico and from abroad. 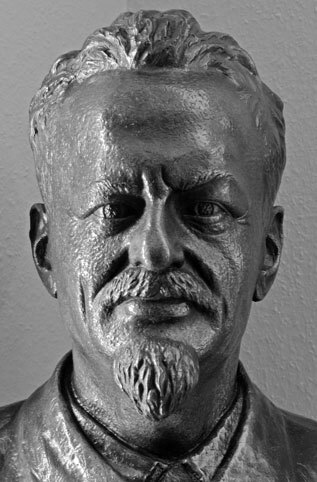 For more details see for instance Leon Trotsky Museum, Mexico City [Wikipedia article] and particularly the above-mentioned Trotsky Museum: past and present by Gabriel García Higueras within TrotskyanaNet.